In his day he'd been a bolt of lightning, a champion beyond equal. But his day being done, Silver Flash was retired to a farm in upstate New York to create new champions as fast as the bolt of lightning he had once been. 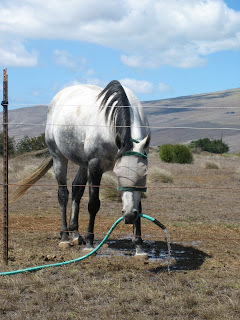 But Silver Flash shied away from the waiting fillies, brooding by himself in the corner of the corral. "What do I have to do?" I pleaded. "Play Barry White music? Show you racy pictures of My Friend Flicka?" Silver Flash grabbed a thin wobbly garden hose spurting a small spray of water and pulled it towards me. "Don't worry, old boy!" I said. "Number One, you are a horse. And Number Two, I know for sure you're not Jewish." Picture prompt above, story below, and at 124 words it's over the limit but hardly a word runaway. Hope you're not too disappointed the story is about a race horse and not about me as you obviously expected and eagerly anticipated. This is my weekly contribution to the Fabulous Friday Fictioneers and Stallion Stud Service Society. Click the link when you're ready to rear up and mount the posts of the many other ready, willing, and talented Fictioneers. Whoa, boy, that's the spirit! See you next week. Well Happy 300th Blog Post Perry! It's amazing how much we write and never really take the time to count it all. Now I should count how many blog posts I've done. By the way, I love your new header above it suits what you are doing. A nice little view of how the horse feels about the purpose thrust upon it. Perhaps he just hasn't met the right filly for him. :) Nicely done Perry. Ah, those wily fillies. Nice job. My horse is a female. Funny how we all see it so differently. A wonderful story Perry. Poor Silver may need some blue horse pills to help him out. Have a great weekend. Yes, he's not so unlike many humans, so it seems! I think in his case he's expected to meet the right squadron of fillies for him. Well, let's give him some privacy! Tell your horse to be gentle with Silver Flash, please. He's not used to be a stud yet. Yes, but hopefully you didn't think it was going to be about this man, especially if you had just eaten. Of course he's not Jewish. If he were Jewish, he'd be huddled in the stable beside his mother, eating chopped liver and oats. Love the line "Show you racy pictures of My Friend Flicka?" A neat take on the photo prompt... And what fun lines for Barry White music and My Friend Flicka! I never thought about that movie in quite this way! And how many reemember My Friend Flicka these days starring Gene Evans, Anita Louise, and ... some kid, I don't even remember his name? Have a good holiday too! Are those bills blue? I certainly wouldn't know. Damn it! My nose just grew even larger! Even horses have fantasies I guess. Hopefully their musical tastes run a bit beyond Barry White! SHIPS!!! (laughed so hard as in...So Hard I Painted Screen - a painting Pollack reference a friend and I parlayed into new computer speak). My story is number 7 inlinkz. Enjoy. Thanks for laughing, the horse and I appreciate it. And we need all the appreciation we can get! Plus I learned a new expression, thanks! Thank you, Barry White intones his thanks too! I love that you tagged this “seduction humor”. Well, there are some lessons in how to seduce someone, provided that someone's name is Trigger. Shy and retiring. But since he is retiring, he's got to get on the ball... so to speak! Thanks for the compliment. The poor, old, uncircumcised horse (Ouch, that hurts just thinking about it). I bet he's lost most of his teeth too. Give him a half dozen Viagra and put the mare in a skimpy two piece bathing suit. Great story. Apparently there's a pressure being a stud. Giving him a half dozen Viagra and putting her in a skimpy two piece bathing suit might work for me, but I'm not sure about it for him. Actually it's probably the other way around. What? I've read about it. I like to read. Another great one, Perry. Always enjoy your shorts!! Shirley, talk about fantasies ... you've never been anywhere near my shorts!